Downloaded designed for Android 6.0 (Marshmallow) and up only ask for permission the first time you use a feature rather than asking for permissions out of context. Desde una de las pantallas de inicio, ve a: Apps > Settings > Applications/Apps. 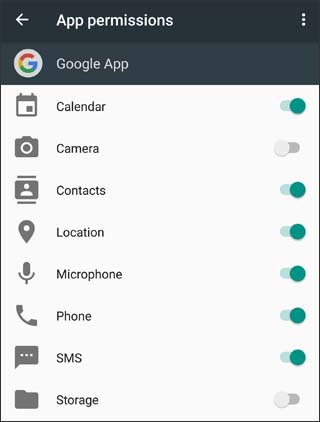 Tap any of the available permissions (e.g., Camera, Contacts, Location, etc.) to turn on o desactivar . If turning off a permission, from the 'If you deny this permission...' prompt, tap Cancel or tap Deny.